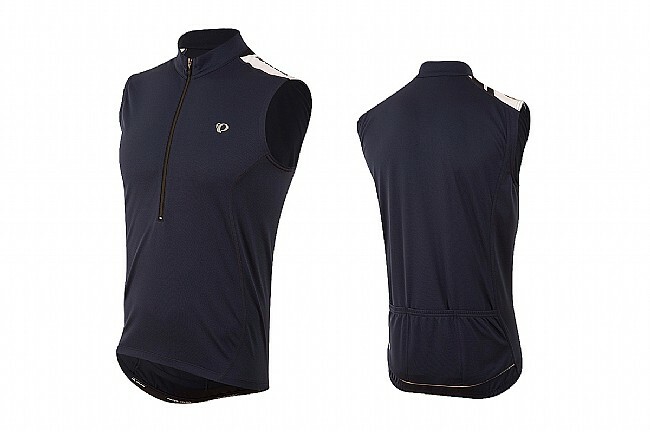 If you're personal quest is to grind out some serious miles in comfort, the Pearl Izumi Quest Sleeveless Jersey has got you covered. The SELECT transfer fabric offers superior comfort, durability, and moisture wicking to keep you comfortable all day long. The 10" front zipper allows for customized on-the-go ventilation, and three rear cargo pockets hold your phone, nutrition, and even a light jacket for those misty days. Available in multiple colors. Reflective elements increase visibility in low light. 100% polyester. Semi-form fit. There are three pockets and the zipper functions well . I also like the reflective stripe on the back of the jersey. This is a great semi loose fitting jersey for riding in the 90 degree plus days !!!!!! Liked everything about except the rear pockets may be a bit too long. Sometimes the rear of the jersey hangs up on the seat if I'm carrying too much stuff.